The 2018 campaign started in earnest this week for the Honda Racing roads team as they embarked on their first pre-season test at Monteblanco in Spain, with its new rider line-up of Ian Hutchinson and Lee Johnston. Although not riding at the test, as he still continues his recovery, ‘Hutchy’ was present for all three days and worked with the team as Johnston got to grips with the Fireblade SP2. Plagued with intermittent weather over the three days, track time was limited and it wasn’t until the final day (Wednesday 7 March) that the team and Johnston were able to get their teeth stuck into the testing programme. With Hutchy not able to ride his machine, it was over to ‘The General’ who tested both his and Hutchy’s Honda CBR1000RR Fireblade SP2s back-to-back, as well as Johnston aboard the Honda Superstock machine. Although not riding, Hutchy was able to work with the team with feedback from Johnston on the set-up of his right-hand gear shifter. Johnston has history already with the SP2, as in 2017 he was a reserve 24 Heures Motos rider for the Honda Endurance Racing team, but with three riders to cater for the machine set up is very different to his Fireblade for the road racing season. Working on the set-up of the bike and making it feel like his own, the team and Johnston finished the test positive with over 100 laps of the 2.76-mile circuit completed. With lap times a second quicker than previous tests at the circuit, the team are ready to continue its testing programme later this month back on UK soil at Castle Combe. 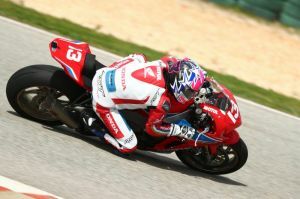 For all real-time news and information on the team follow @HondaRacingCBR on Twitter.